Cash Flow Statements help traders understand how a company is utilizing their free cash. The cash flow statement illustrates how much cash has come into and gone out of the company for the quarter. This section is composed of three parts: operating activities, investing activities and financing activities. Operating activities itemizes the cash generated from the operations of the business. It shows how much cash has been used in order to generate the sales of products and services. Naturally, a stable company wants to maintain a positive cash flow from operating activities. Certain types of companies like early stage technology or biotechnology companies will often show negative cash flow here and on capital expenditures without much effect on the underlying stock price. Investing activities refers to the capital expenditures (cap ex). Cap ex is the amount of money the company spends on equipment, research and development and build out to ensure growth and profits down the road. More cap ex spending usually equates to short-term pain for long-term gain. Biotechnology and technology companies commonly allocate large chunks of cash flow in anticipation for future demand or milestone break through. Financing activities refers to fund raising efforts through stock sales, bond issuances, bank loans, credit facilities and private placements. Stock buybacks and dividend disbursements are also listed in the financing activities. 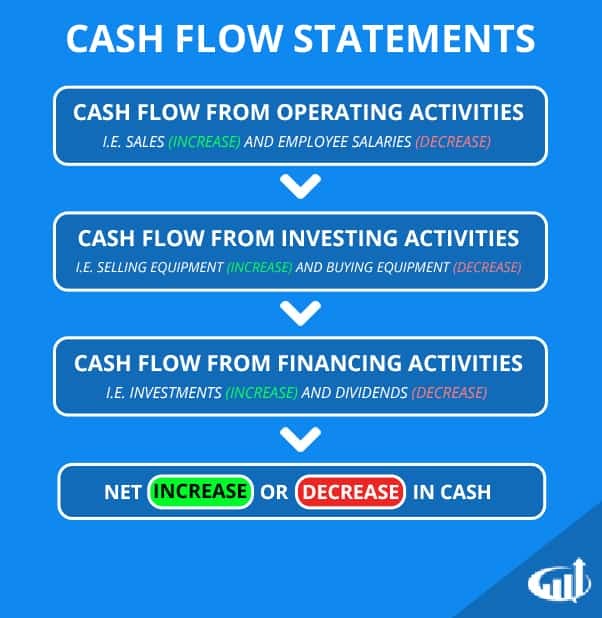 The cash flow statement gives a clearer picture than the income statement as it leaves out non-cash revenue items. Investors often like to use the last line as the true ‘bottom’ line determination of profit or loss.